International Monetary Fund (IMF) chief Christine Lagarde has said that the organisation's next forecast for global economic growth would be down from the 3.5% predicted in April. She also hailed EU leaders' efforts to solve the debt crisis. She said "significant steps" had been taken, but further reforms and strong implementation were needed. Christine Lagarde was speaking at an economic symposium in Tokyo as part of a week-long tour of Asia. But there were signs that those significant steps had still not calmed investors. The yield on Spanish 10-year bonds, which is taken as an indicator of how much the government would have to pay to borrow money, rose sharply on Friday. It rose to 6.9%, close to the 7%, which is considered unaffordable in the long term. Christine Lagarde was clear that further measures were needed. Referring to measures adopted by eurozone leaders in Brussels last week, she said: "From the IMF perspective, we believe that more needs to be done in order to complete [the reform]. "It's also a question of implementation - diligent, rigorous, steady implementation." She particularly praised moves towards banking union. But she added that more would need to be done both inside and outside the eurozone, with renewed attempts at increased co-operation between countries. She said they should work together to restore trust in sovereign debt, reform the financial sector and achieve sustained growth. 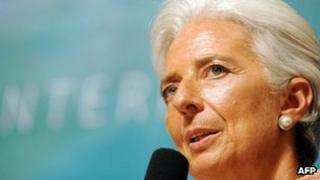 She warned that the IMF's forecast for global economic growth, which is due out later this month, would be lowered. "What I can tell you is that it will be tilted to the downside and certainly lower than the forecast that was published three months ago," she said. Japanese Prime Minister Yoshihiko Noda complained that Europe's debt problems were hurting the Japanese economy because they were causing unjustified rises in the value of the yen. "Market jitters on eurozone problems, especially one-sided yen rises that do not reflect Japan's economic fundamentals, are inflicting severe damage on economic sentiment," he said. Credit ratings agency Moody's also said on Friday that the short-term risks to the eurozone economy had reduced. But it warned there would be a high cost to wealthier eurozone countries. The eurozone's problems could return to prominence later on Friday, when Greek Prime Minister Antonis Samaras is due to outline to parliament his government's proposals for revising the terms of the bailout from the EU and the IMF. But there have been reports that the Greek government has decided that it is falling too far behind its targets to be able to renegotiate the terms. EU finance ministers are due to meet next Monday to discuss the issues leftover from last week's summit.